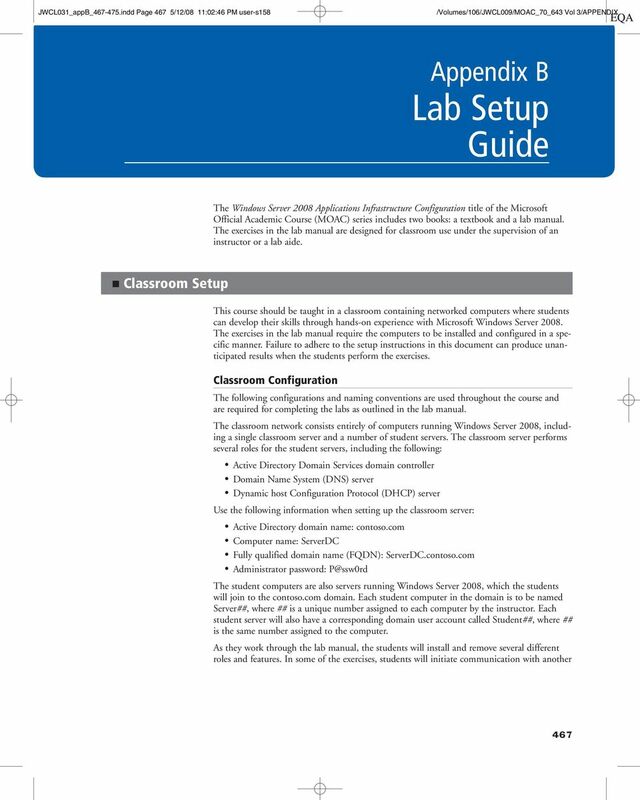 Download "Appendix B Lab Setup Guide"
3 JWCL031_appB_ indd Page 469 5/12/08 11:02:47 PM user-s158 Lab Setup Guide 469 SOFTWARE REQUIREMENTS Windows Server 2008, Standard or Enterprise Classroom Server Setup Instructions WARNING By performing the following setup instructions, your computer s hard disks will be repartitioned and reformatted. You will lose all existing data on the system. Before you begin, do the following: Read this entire document. Verify that you have the Instructor CD provided with the course materials and the installation disk for Microsoft Windows Server Installing Windows Server 2008 Using the following setup procedure, install Windows Server 2008 on ServerDC. INSTALL WINDOWS SERVER Boot the computer from the Windows Server 2008 Installation disk. When you boot from the disk, the Windows Server 2008 Setup program starts automatically and the Install Windows page appears. 2. Modify the Language to install, Time and currency format, and Keyboard or input method settings, if necessary. Click Next. 3. Click Install now. The Type your product key for activation page appears. 4. Enter your product key in the Product key text box and click Next. The Please read the license terms page appears. 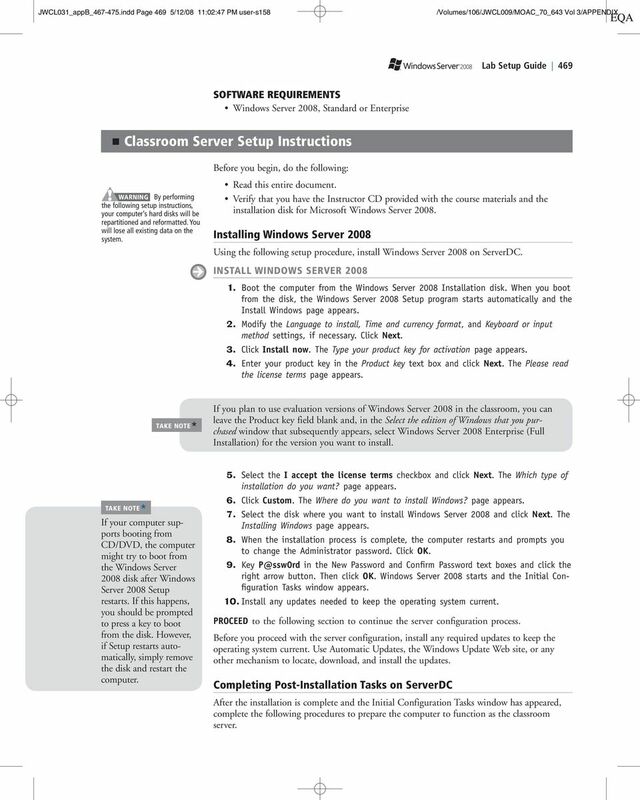 If you plan to use evaluation versions of Windows Server 2008 in the classroom, you can leave the Product key field blank and, in the Select the edition of Windows that you purchased window that subsequently appears, select Windows Server 2008 Enterprise (Full Installation) for the version you want to install. If your computer supports booting from CD/DVD, the computer might try to boot from the Windows Server 2008 disk after Windows Server 2008 Setup restarts. If this happens, you should be prompted to press a key to boot from the disk. However, if Setup restarts automatically, simply remove the disk and restart the computer. 5. Select the I accept the license terms checkbox and click Next. The Which type of installation do you want? page appears. 6. Click Custom. The Where do you want to install Windows? page appears. 7. Select the disk where you want to install Windows Server 2008 and click Next. The Installing Windows page appears. 8. When the installation process is complete, the computer restarts and prompts you to change the Administrator password. Click OK. 9. Key in the New Password and Confirm Password text boxes and click the right arrow button. Then click OK. Windows Server 2008 starts and the Initial Configuration Tasks window appears. 10. Install any updates needed to keep the operating system current. PROCEED to the following section to continue the server configuration process. Before you proceed with the server configuration, install any required updates to keep the operating system current. Use Automatic Updates, the Windows Update Web site, or any other mechanism to locate, download, and install the updates. Completing Post-Installation Tasks on ServerDC After the installation is complete and the Initial Configuration Tasks window has appeared, complete the following procedures to prepare the computer to function as the classroom server. 4 JWCL031_appB_ indd Page 470 5/12/08 11:02:47 PM user-s Appendix B PERFORMING INITIAL CONFIGURATION TASKS Use the following procedure to prepare the server for the course. PERFORM INITIAL CONFIGURATION TASKS 1. In the Initial Configuration Tasks window, click Set time zone. The Date and Time dialog box appears. 2. Verify that the date, time, and time zone shown in the dialog box are correct. If they are not, click Change date and time or Change time zone and correct them. Then click OK. 3. Click Configure Networking. The Network Connections window appears. 4. Right-click the Local Area Connection icon and, from the context menu, select Properties. 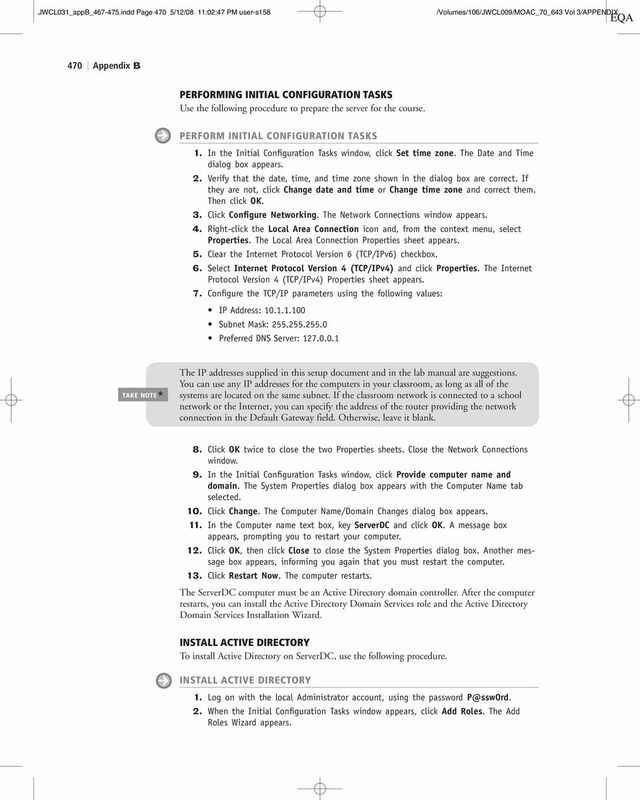 The Local Area Connection Properties sheet appears. 5. Clear the Internet Protocol Version 6 (TCP/IPv6) checkbox. 6. Select Internet Protocol Version 4 (TCP/IPv4) and click Properties. The Internet Protocol Version 4 (TCP/IPv4) Properties sheet appears. 7. Configure the TCP/IP parameters using the following values: IP Address: Subnet Mask: Preferred DNS Server: The IP addresses supplied in this setup document and in the lab manual are suggestions. You can use any IP addresses for the computers in your classroom, as long as all of the systems are located on the same subnet. If the classroom network is connected to a school network or the Internet, you can specify the address of the router providing the network connection in the Default Gateway field. Otherwise, leave it blank. 8. Click OK twice to close the two Properties sheets. Close the Network Connections window. 9. In the Initial Configuration Tasks window, click Provide computer name and domain. The System Properties dialog box appears with the Computer Name tab selected. 10. Click Change. The Computer Name/Domain Changes dialog box appears. 11. In the Computer name text box, key ServerDC and click OK. A message box appears, prompting you to restart your computer. 12. Click OK, then click Close to close the System Properties dialog box. Another message box appears, informing you again that you must restart the computer. 13. Click Restart Now. The computer restarts. The ServerDC computer must be an Active Directory domain controller. After the computer restarts, you can install the Active Directory Domain Services role and the Active Directory Domain Services Installation Wizard. INSTALL ACTIVE DIRECTORY To install Active Directory on ServerDC, use the following procedure. INSTALL ACTIVE DIRECTORY 1. Log on with the local Administrator account, using the password 2. When the Initial Configuration Tasks window appears, click Add Roles. The Add Roles Wizard appears. 6 JWCL031_appB_ indd Page 472 5/12/08 11:02:48 PM user-s Appendix B 9. Select the Activate this scope checkbox and click OK. Then click Next. 10. On the Configure DHCPv6 Stateless Mode pane, click Next to accept the default settings. 11. On the Authorize DHCP Server page, click Next to accept the default settings. 12. On the Confirm Installation Selections page, click Install. CLOSE the Initial Configuration Tasks window when the installation is complete. After the DHCP role is installed, all student servers will obtain their IP addresses and other TCP/IP configuration settings via DHCP. Creating User Accounts Each student must have a domain user account called Student##, where ## is the same number as the computer the student is using. To create the student accounts, use the following procedure. CREATE USER ACCOUNTS 1. Click Start, and then select Administrative Tools Active Directory Users and Computers. The Active Directory Users and Computers console appears. 2. Expand the contoso.com domain. 3. Right-click the Users container and select New User. The New Object-User wizard appears. 4. Key Student## in the First Name and User Logon Name text boxes, where ## is the number assigned to the first student computer in the classroom. Then click Next. 5. In the Password and Confirm Password text boxes, key 6. Clear the User Must Change Password At Next Logon checkbox and select the Password Never Expires checkbox. Then click Next. 7. Click Finish to create the user account. 8. Repeat Steps 3 7 to create a Student## user account for each computer in the classroom. 9. Right-click the Users container and select New Group. The New Object-Group wizard appears. 10. In the Group Name text box, key Students. Then click Next. 11. Click Finish to create the group. 12. In the Users container, double-click the Students group you just created. The Students Properties sheet appears. 13. Click the Members tab. 14. Click Add, key the name of the first Student## user you created, and click OK. 15. 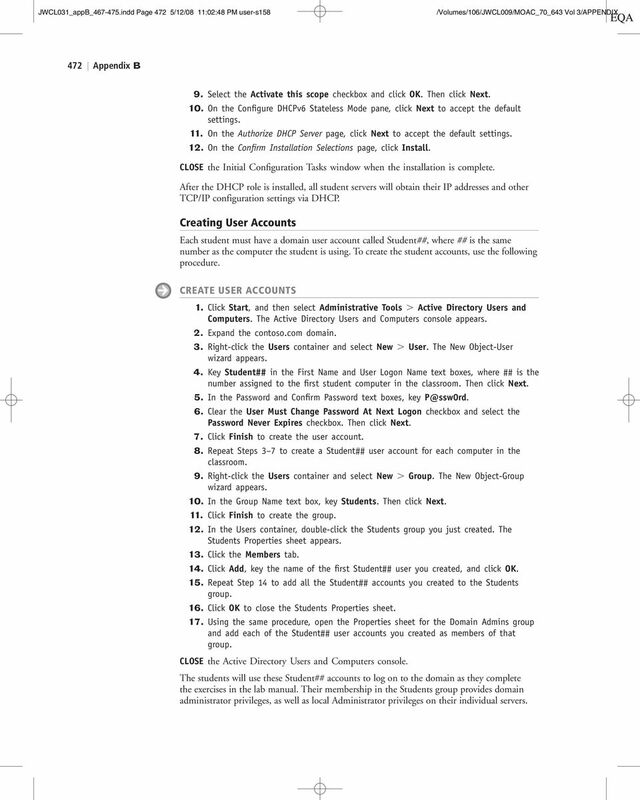 Repeat Step 14 to add all the Student## accounts you created to the Students group. 16. Click OK to close the Students Properties sheet. 17. Using the same procedure, open the Properties sheet for the Domain Admins group and add each of the Student## user accounts you created as members of that group. CLOSE the Active Directory Users and Computers console. The students will use these Student## accounts to log on to the domain as they complete the exercises in the lab manual. Their membership in the Students group provides domain administrator privileges, as well as local Administrator privileges on their individual servers. 7 JWCL031_appB_ indd Page 473 5/16/08 12:12:01 AM epg /Volumes/106/JWCL008/McEntire%0/CH12 Lab Setup Guide 473 PREPARING THE FILE SYSTEM From the Microsoft Web site, download the following add-on modules for Windows Server 2008: Windows Media Services 2008 for Windows Server 2008 Server MSU file Windows SharePoint Services 3.0 with Service Pack 1 Microsoft FTP Publishing Service for IIS 7.0 Windows Media Services 2008 and Windows SharePoint Services 3.0 with Service Pack 1 are available from the Microsoft Download Center at Microsoft FTP Publishing Service for IIS 7.0 is available from Microsoft s Internet Information Services site at Complete the following procedure to make these modules available to the students and provide the students with storage on the classroom server. PREPARE THE FILE SYSTEM 1. On the server s C drive, create a new folder called \Install and three subfolders called \Install\MediaSvcs, \Install\FTP7, and Install\SharePoint. 2. Copy the add-on modules you downloaded to the appropriate folders. 3. Share the C:\Install folder using the share name Install, and then grant only the Allow Read share permission to the Everyone special identity. 4. Using Windows Explorer, grant the Students group the Allow Read, Allow Read & Execute, and Allow List Folder Contents NTFS permissions for the C:\Install folder. 5. Also on the server s C drive, create a new folder called \Students and copy the \Worksheets folder from your instructor disk to the C:\Students folder. 6. Grant the Students group the Allow Full Control NTFS permission for the C:\Students folder. 7. Share the C:\Students folder using the share name Students, and then grant the Everyone special identity the Allow Full Control share permission. CLOSE the Windows Explorer window. These folders provide students with the additional software they need to complete the lab exercises and storage space to keep their lab worksheet files. CONFIGURING FILE REDIRECTION To complete the lab exercises, each student must be able to store files on the classroom server. Use Group Policy to redirect each user s Documents folder to the classroom server drive, using the following procedure. CONFIGURE FILE REDIRECTION 1. Click Start, and then select Administrative Tools Group Policy Management. The Group Policy Management console appears. 2. In the scope (left) pane, expand the console tree to display and select the Group Policy Objects node under the contoso.com domain. 3. In the detail (right) pane, right-click the Default Domain Policy GPO and, from the context menu, select Edit. The Group Policy Management Editor window appears. 4. Navigate to the User Configuration Policies Windows Settings Folder Redirection folder. Then, right-click the Documents subfolder and, from the context menu, select Properties. The Documents Properties sheet appears. 5. From the Setting dropdown list, select Basic Redirect Everyone s folder to the same location. 8 JWCL031_appB_ indd Page 474 5/12/08 11:02:48 PM user-s Appendix B 6. In the Target Folder Location box, verify that the default Create a folder for each user under the root path option is selected. 7. In the Root Path text box, key \\ServerDC\Students. 8. Click the Settings tab and clear the Grant the user exclusive rights to Documents checkbox. 9. Click OK to close the Documents Properties sheet. CLOSE the Group Policy Management Editor and Group Policy Management consoles. The computer is ready to function as the classroom server. You can install the student servers. Depending on the capabilities of your virtualization software and the type of licensing your school provides, you can perform a Windows Server 2008 installation on a single virtual machine and then clone multiple instances of that virtual machine, rather than perform each OS installation individually. Student Server Setup The setup for the student computers depends on your classroom configuration. The result is a bare Windows Server 2008 installation, which students can configure. 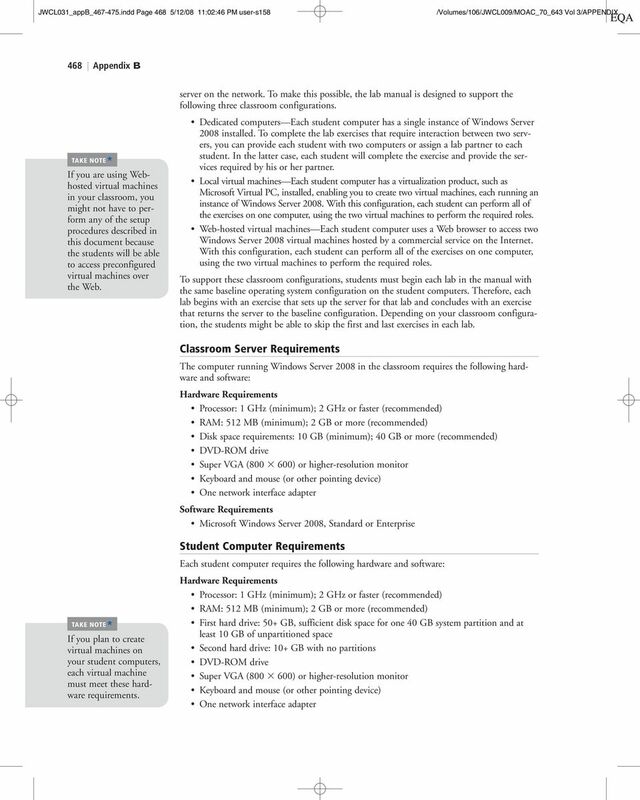 However, the tasks you must complete before the students arrive vary, as follows: Dedicated computers If each student computer in your classroom will have a single copy of Windows Server 2008 installed on it, proceed directly to the following Install Windows Server 2008 procedure. Local virtual machines If you plan to use a virtualization product on the student computers to enable each system to run multiple copies of Windows Server 2008, first you must install the virtualization software on each computer according the manufacturer s instructions and create a virtual machine for each copy of Windows Server 2008 you plan to install. Then, install the operating system on each virtual machine, using the following Install Windows Server 2008 procedure. Web-hosted virtual machines If your students will access virtual machines provided by a commercial service over the Web, then your classroom computers can run any operating system that provides the appropriate Web browser application. All of the operating systems are preinstalled, so you can skip the following procedure. INSTALLING WINDOWS SERVER 2008 ON A STUDENT COMPUTER Using the following setup procedure, install Windows Server 2008 on the student computers. WARNING By performing the following setup instructions, your computer s hard disks will be repartitioned and reformatted. You will lose all existing data on the system. INSTALL WINDOWS SERVER Boot the computer from the Windows Server 2008 Installation disk. When you boot from the disk, the Windows Server 2008 Setup program starts automatically, and the Install Windows page appears. 2. Modify the Language to install, Time and currency format, and Keyboard or input method settings, if necessary, and click Next. 3. Click Install now. The Type your product key for activation page appears. 4. Enter your product key in the Product key text box and click Next. The Please read the license terms page appears. 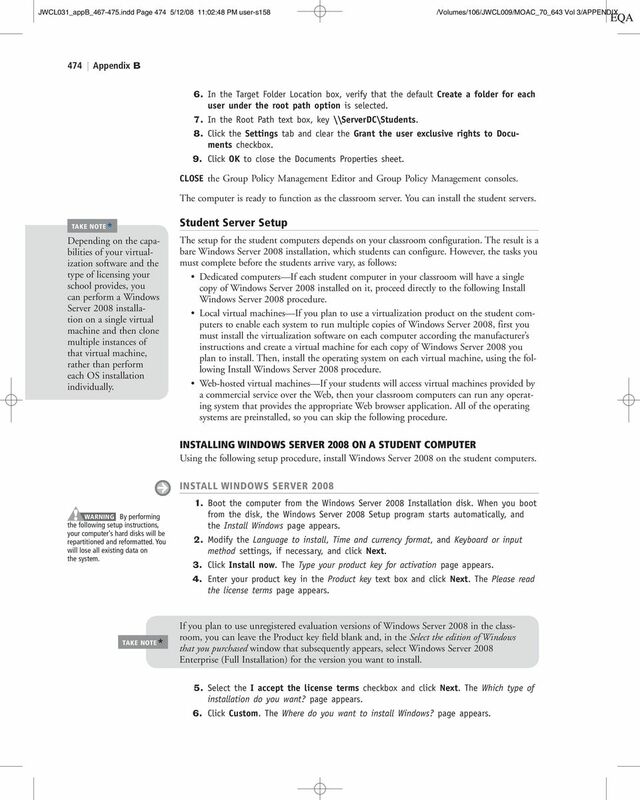 If you plan to use unregistered evaluation versions of Windows Server 2008 in the classroom, you can leave the Product key field blank and, in the Select the edition of Windows that you purchased window that subsequently appears, select Windows Server 2008 Enterprise (Full Installation) for the version you want to install. 5. Select the I accept the license terms checkbox and click Next. The Which type of installation do you want? page appears. 6. Click Custom. The Where do you want to install Windows? page appears. 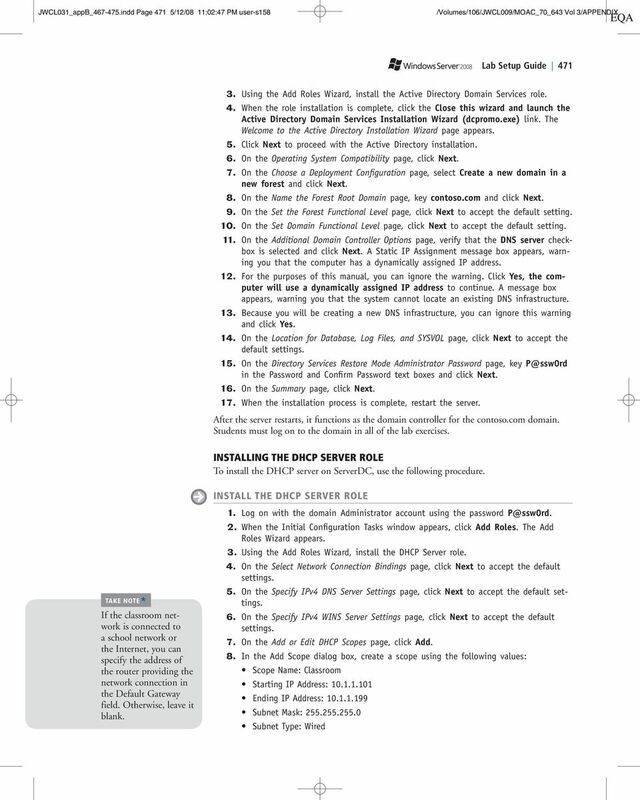 9 JWCL031_appB_ indd Page 475 5/12/08 11:02:48 PM user-s158 Lab Setup Guide Select the disk where you want to install Windows Server 2008 and click Drive Options. 8. Click New. In the Size text box, key Click Apply. 9. Select the partition you just created and click Next. The Installing Windows page appears. 10. When the installation process is complete, the computer restarts and prompts you to change the Administrator password. Click OK. If your computer supports booting from CD/DVD, the computer might try to boot from the Windows Server 2008 disk after Windows Server 2008 Setup restarts. If this happens, you should be prompted to press a key to boot from the disk. However, if Setup restarts automatically, simply remove the disk and restart the computer. 11. Key in the New Password and Confirm Password text boxes and click the right arrow button. Then click OK. Windows Server 2008 starts and the Initial Configuration Tasks window appears. 12. Install any updates needed to keep the operating system current. CLOSE the Initial Configuration Tasks window. The computer is ready for a student to begin working through the lab manual. The student will perform all of the initial configuration tasks that the computer requires. In the Active Directory Domain Services Window, click Active Directory Domain Services. Installing the Active Directory Domain Services Role Press the Ctrl-Alt-Del on the xxrwdc computer. Log in as the default administrator of the local computer with the username Administrator and cisisthebest! Installing Active Directory 119 Installing Active Directory Installing Active Directory is an easy and straightforward process as long as you planned adequately and made the necessary decisions beforehand. Building a SharePoint 2010 Virtual Machine Overview: This document provides links to Internet resources and step by step instructions for building a Virtual Machine (VM) sample SharePoint Server 2010 environment. Please ring the Service Desk on 8204 1866 or 1300 363 227 if you require assistance or encounter problems. BEFORE YOU BEGIN Sites that do not have an Administration File Server are known as Peer to Peer sites. They have only Administration Workstations with one workstation that performs the nightly backup process. Installing and Configuring Windows Server 2008. Module Overview 14/05/2013. 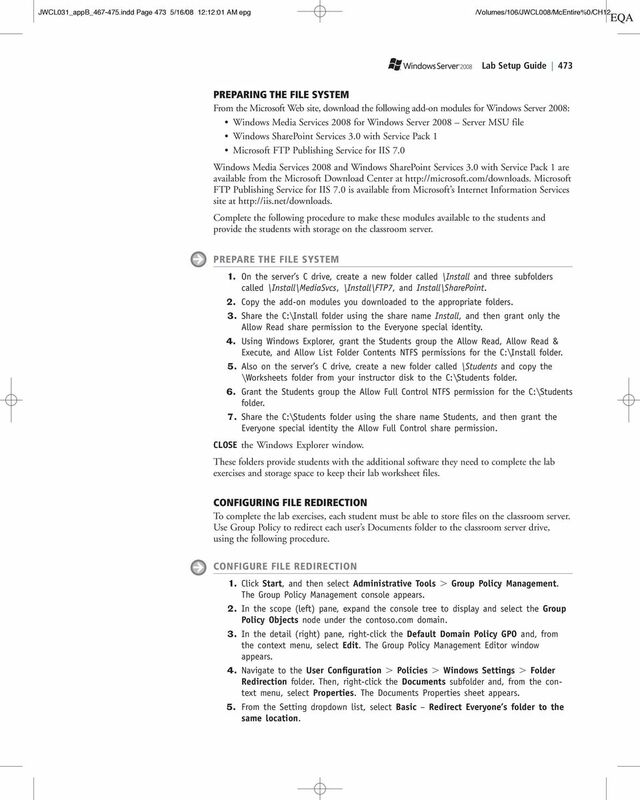 Lesson 1: Planning Windows Server 2008 Installation.